This was our first big RV trip with our brand new truck and 5th wheel trailer. 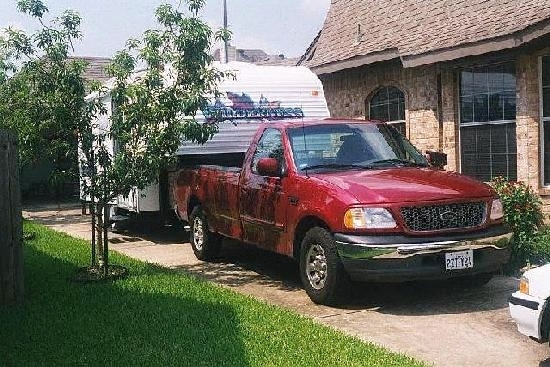 It was to be the beginning of many great RV vacations in the coming years. We hope you enjoy some of our adventures that follow in the years after 1999. Our trip began on Tuesday, May 25th as we departed from Richmond via Alt 90 west. The plan was to stay away from freeways and super highways as much as possible so that we could take a more leisurely pace and be closer to the scenery. We also planned to drive at 50 to 55 miles per hour which might be a problem on the freeway. Our plan on the first day was to get as far away from Houston as possible, and close enough to easily make it into Big Bend the next day. 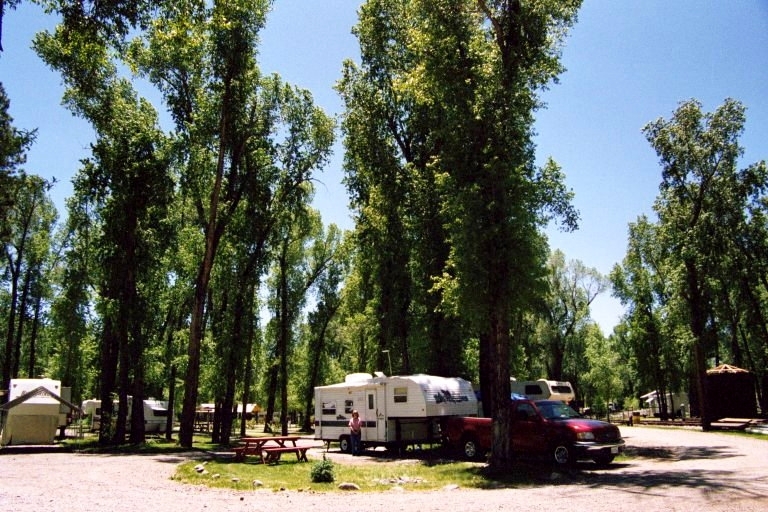 We spent the first night at the American Campground RV Park in Del Rio. Wednesday morning we headed west again on Hwy 90. 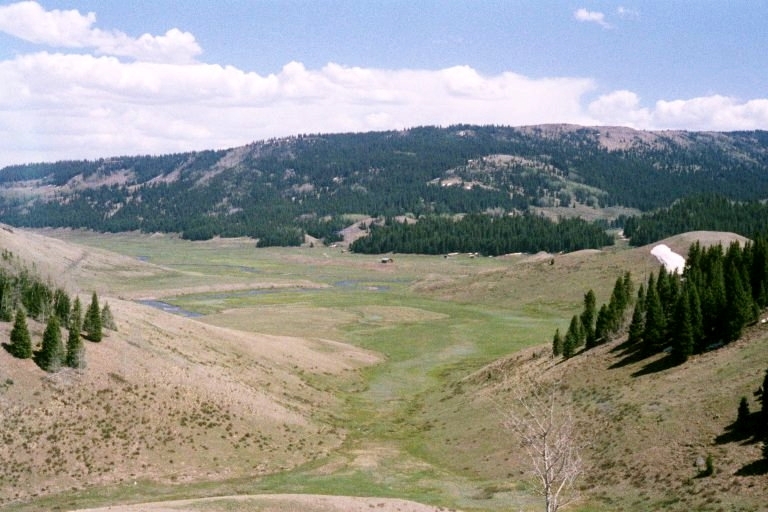 The road goes across Amistad Reservoir and follows roughly parallel to the Rio Grande River to Langtry. In Langtry we stopped for a few hours at the Judge Roy Bean Visitor Center. 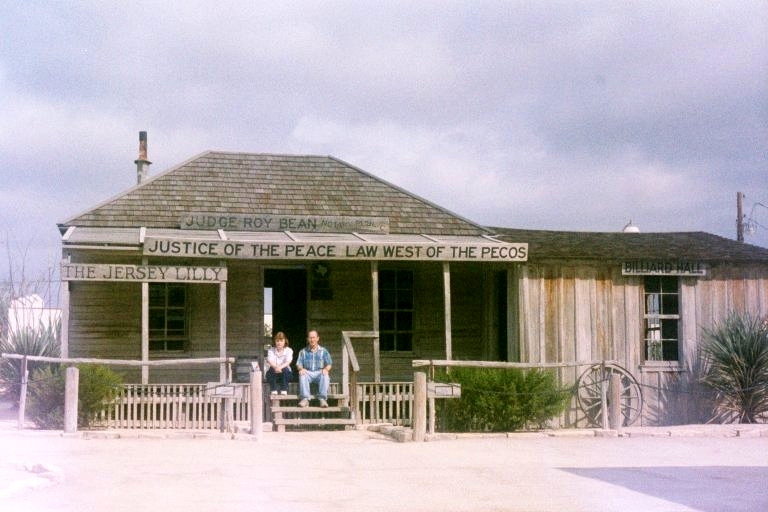 We saw the Jersey Lilly saloon where the Judge was "the law west of the Pecos". We continued west to Marathon and turned south on Hwy 385 toward Big Bend. 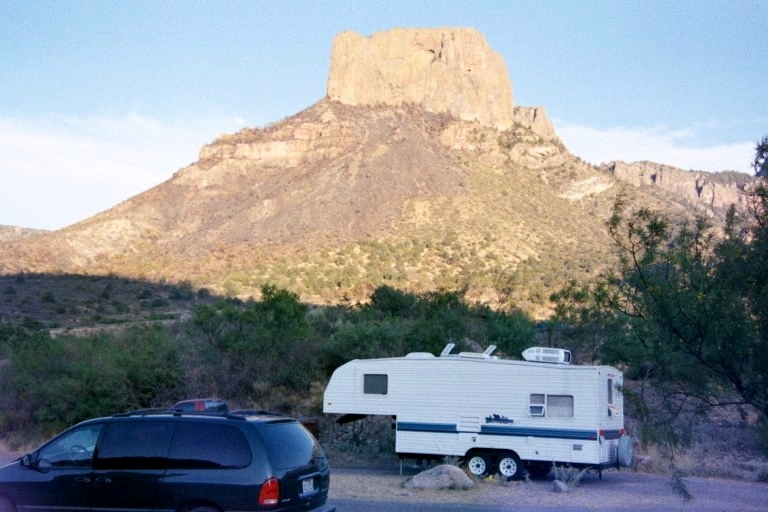 We arrived early in the afternoon at Stillwell Store & RV Park, just outside the north entrance to Big Bend Park. We enjoyed a tour of the Hallie Stillwell Museum Hall of Fame which is next door to the RV park. Thursday morning we entered Big Bend National Park and camped in the Chisos Basin campground (5,400 ft elevation). 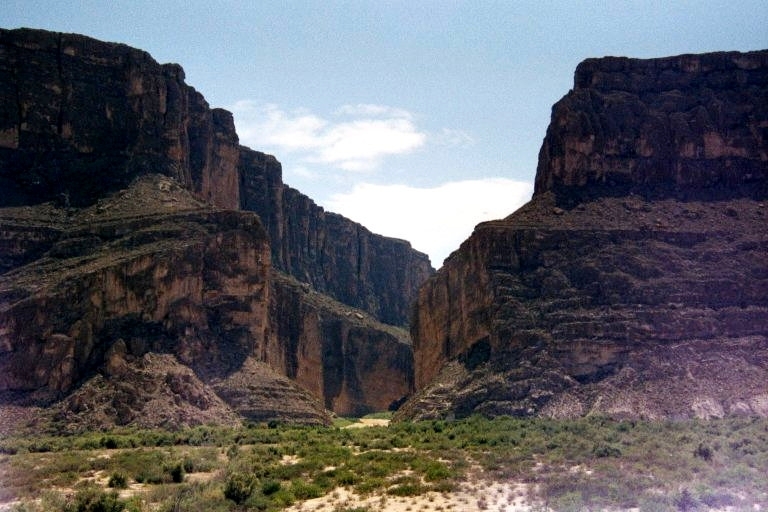 That afternoon, we drove the Ross Maxwell Scenic Drive to Castolon and Santa Elena Canyon Overlook. The temperature was over 100 degrees on the river, but in the 70's in the Chisos Mountains at our campground. It got into the 40's Thursday night and we had to pull out the blankets in the middle of the night and turn on the heater next morning. Friday morning we went on a bird watching hike around the campground with a park ranger and got our first experience with "professional" birdwatchers. That afternoon, we exited the park to the west and spent the night in Study Butte/Terlingua at Big Bend Motor Inn campground. That night there was a big storm that just missed us, but the wind blew hard and reminded us that we were not in a real house! Saturday morning we drove north on Hwy 118 to Alpine, then Hwy 90 through Marfa to Van Horn. We wanted to see the set for the movie Giant, but found out that it's on private property. On the road west of Marfa, we passed the viewing park for the Marfa lights on the side of the highway. We spent the night in Van Horn at Mountain View RV Park. Sunday we drove north on Hwy 54 (sign said 100 miles to next gas), past about 100 wind turbine power generators lined up along the top of the Delaware Mountain range, on to Hwy 62, then at Carlsbad we took Hwy 285 to Roswell, where we spent the night at Town & Country RV Park. That afternoon we went to see the International UFO Museum & Research Center. Monday we went west from Roswell on Hwy 380 to Carrizozo, where we turned north on Hwy 54 to Hwy 42. 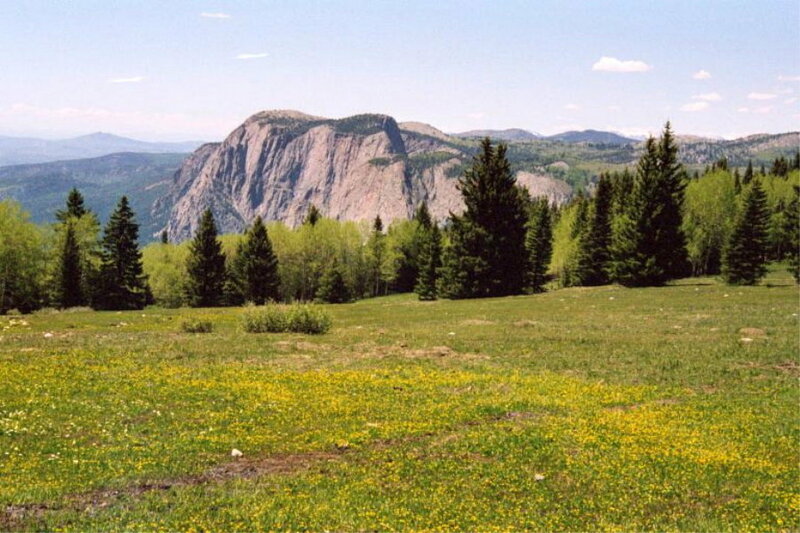 At Willard, we took Hwy 41 to I-40, then I-40 to Tijeras where we stayed two nights at Hidden Valley RV Resort. We were up about 6,000 ft in the Sandia Mountains east of Albuquerque. 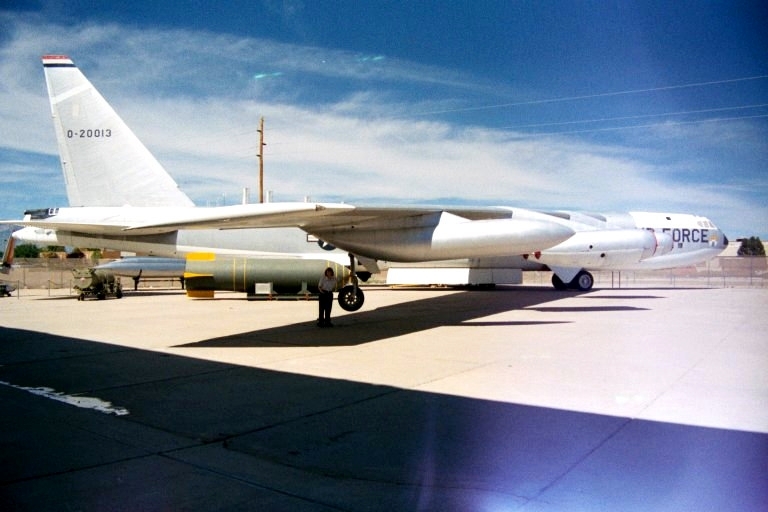 Tuesday we went into Albuquerque to the National Atomic Museum located on Kirtland Air Force Base. We spent the whole day looking at their very extensive display of atomic bombs and related military equipment from the past 50 years. 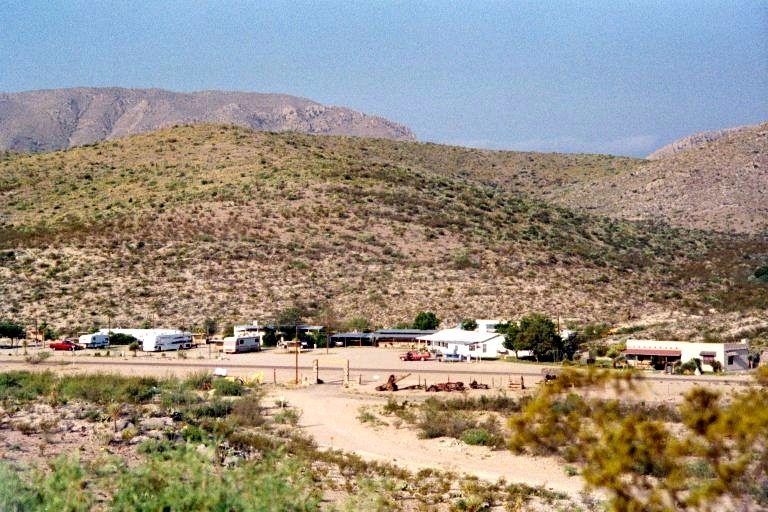 Wednesday morning we moved our trailer a few miles away (up Hwy 14) to Turquoise Trail RV park. We went into Albuquerque to the Albuquerque Museum of Art & History. They have displays that show 400 years of the history of the Rio Grande valley. Afterwards, we went to the Indian Pueblo Cultural Center, where each of the 19 NM Indian tribes has a display of their crafts. On Thursday, we went to the University of NM and saw the Meteorite Museum. I was surprised that they had specimens that weigh several thousand pounds. Next door was the Geology Museum with all the rocks you would care to see. That afternoon, we pulled the trailer north on Hwy 14 (Turquoise Trail) to Santa Fe. At Santa Fe, we stayed east of town off I-25 at Rancheros de Santa Fe Campground for two nights. Friday we went to old town Santa Fe. Sites we saw were the Cathedral of St. Francis of Assisi, the Mission of San Miguel of Santa Fe (built in 1610), the Oldest House in Santa Fe (built in the 1600s), the Palace of the Governors (built in 1610, one of the oldest public buildings in the U.S.), and Our Lady of Light Chapel (built in 1878) which contained the "miraculous staircase", a spiral staircase built without nails or visible support. Saturday we drove north from Santa Fe on Hwy 285 to Espanola and onto the San Juan Pueblo where we spent the night at the Ohkay RV Park which is operated by the pueblo. Sunday we went to Bandelier National Monument and looked at the remains of the Anasazi Indian community established 7 or 8 centuries ago. 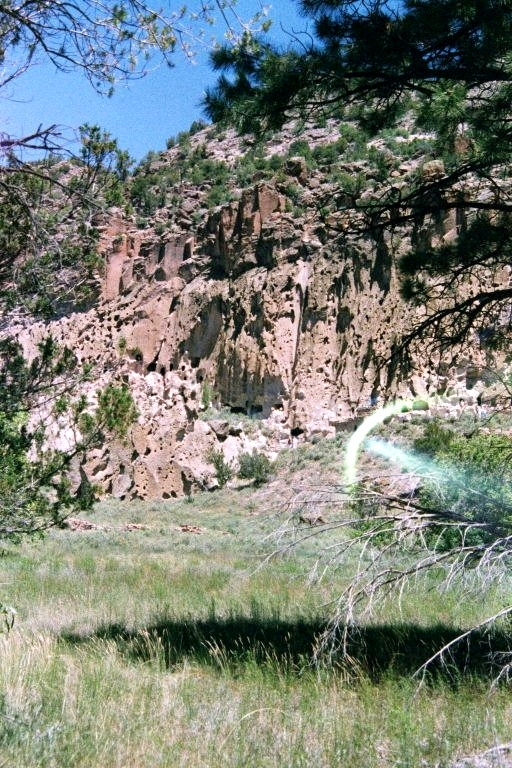 There were pueblo and cliff cave dwellings. In the afternoon we drove to Los Alamos and went through the Bradbury Science Museum. There are displays showing many aspects of the Manhattan Project. The town of Los Amamos was created to make the first A-bomb. 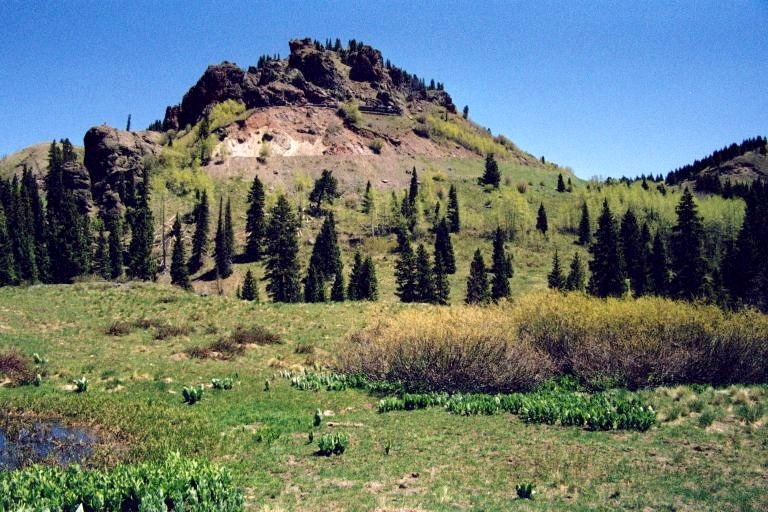 Monday we drove north on Hwy 84 to Chama, where we spent the next two nights. 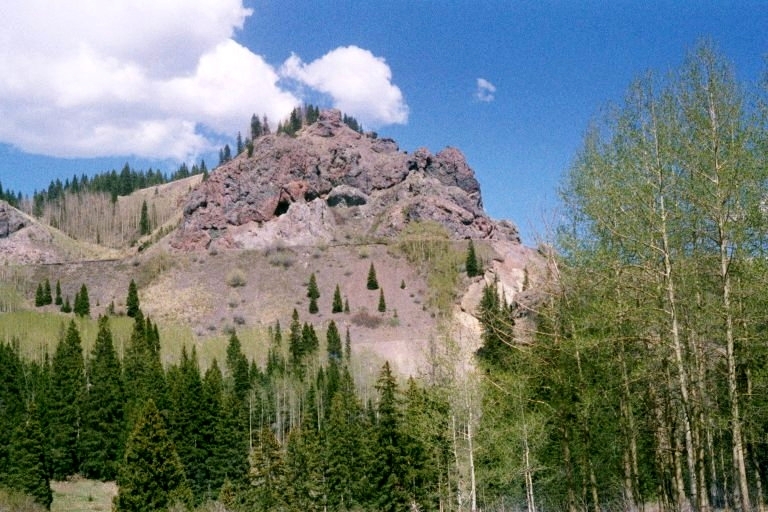 We stayed at the Rio Chama RV Park which is located next to the Chama River and the Cumbres & Toltec Scenic Railroad. 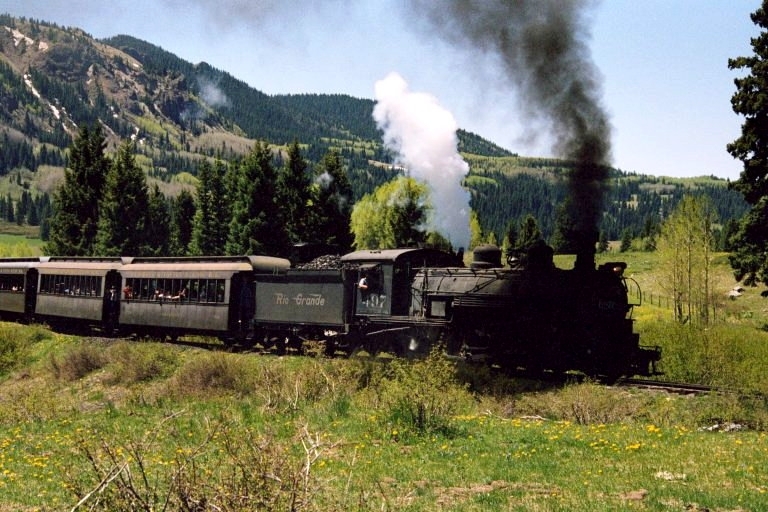 Tuesday we rode the train from Chama to Osier, Colorado, and back. 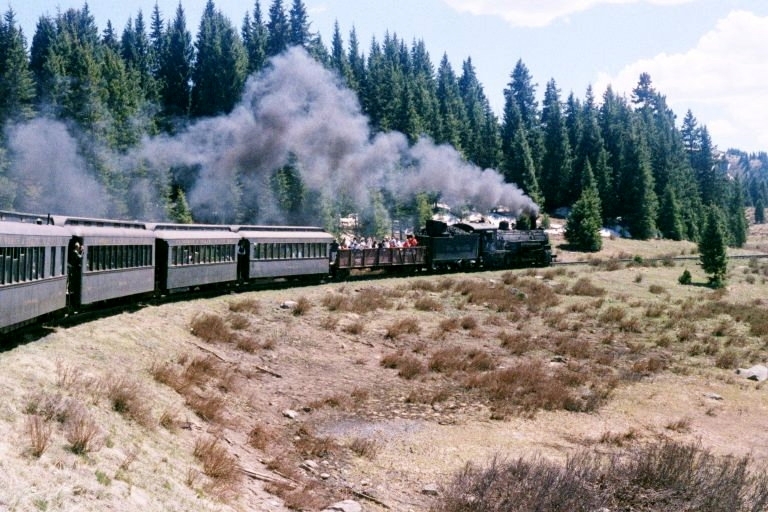 The train is pulled by a narrow-gage (tracks about 3 ft apart) steam locomotive and the track winds through the mountains to 10,015 feet elevation. The views of the Aspen and fir trees, patches of snow, peaceful valleys and beautiful mountain streams was the high point of our trip. Wednesday we reluctantly left Chama, after taking a few more pictures of the train, and took Hwy 64 to Taos. 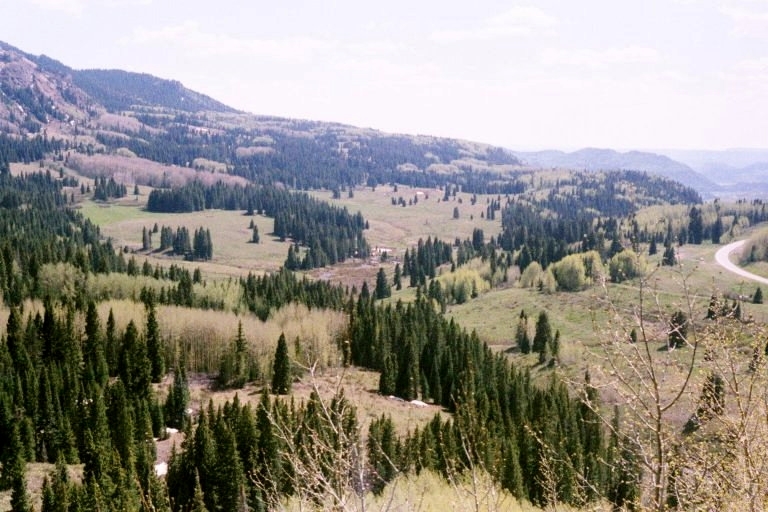 This is a beautiful drive through the Sangre de Cristo Mountains and includes many beautiful valleys and clear-running rivers and streams. 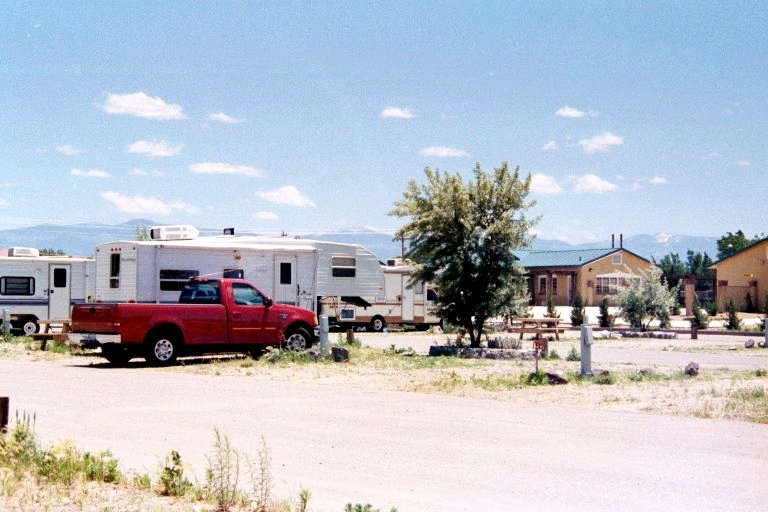 That night we stayed at Taos RV Park. 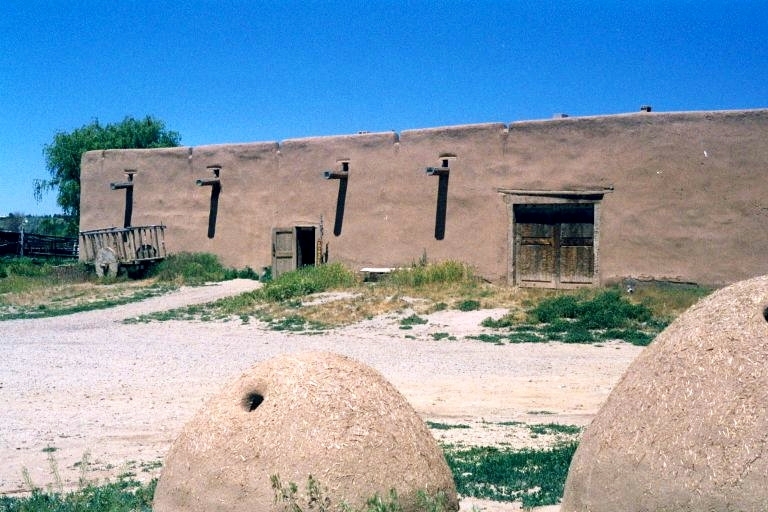 Thursday morning we visited the Pueblo de Taos Indian Reservation which was built in the 1600s. In the afternoon, we visited the Hacienda de los Martinez (c. 1804), a 21-room house built around two large patios. Later that afternoon we drove south from Taos on Hwy 518 to Las Vegas where we stayed at Vegas RV Park. That afternoon, we drove around Las Vegas looking at all the old historic homes and buildings that represent a variety of architecture from the late 1800s. Friday morning we left Las Vegas traveling south on Hwy 84 through Santa Rosa, Ft. Sumner and Clovis. After crossing back into Texas, we turned south on Hwy 214 at Muleshoe. At Seminole, we took Hwy 385 south too Odessa. We stayed at Kay's parents home until Tuesday morning. Tuesday morning we left Odessa via I-20, Hwy 158 and Hwy 87 and spent the night at Mason at the city RV park. Wednesday we left Mason via Hwy 29, Hwy 71 and Alt 90. We arrived back in Richmond mid-afternoon and began cleanup of the rig prior to placing it back into storage. Well, this ends our first RV trip. We hope you enjoyed our web page. We will be taking another trip in the fall, so stay tuned for our further adventures in RV-Land.